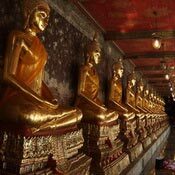 Wat Suthat is one of the oldest and largest temples in Bangkok, famed for its beautiful roofline and its eight metre high 13th-century golden Buddha which contains the ashes of King Rama VIII in its base. 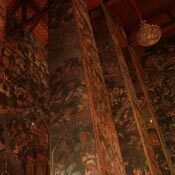 There are also magnificent frescoes and out the front you'll see the refurbished giant swing. 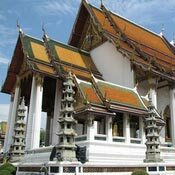 Wat Suthat was begun by King Rama I (1782-1809), founder of the Chakri dynasty, soon after his coronation. 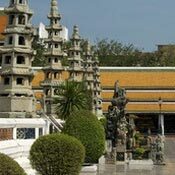 It was continued by Rama II (1809-24) and completed by Rama III (1824-51). 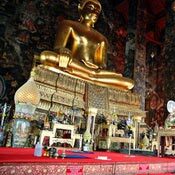 Rama I brought the temple's main Buddha image to Bangkok by river from Sukhothai. 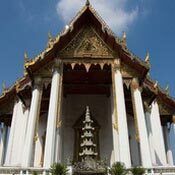 On its arrival, the king declared seven days of festivities and the bronze statue was paraded through the streets on the way to the wihan built specially for it at Wat Suthat. The king himself walked barefoot in the procession and it is said he was so exhausted by the time he arrived that he staggered into the temple. 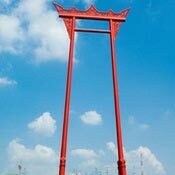 A huge red teak arch, carved under Rama II, is all that remains of an original giant swing, which was used to celebrate and thank Shiva for a bountiful rice harvest and to ask for the god's blessing on the next. Teams of men would ride the swing on arcs as high as 82 feet in the air, trying to grab a bag of silver coins with their teeth. Due to injuries and deaths, the dangerous swing ceremony was discontinued in 1932.